If you’re looking for the best juicer for your kitchen you’ve come to the right place! Below we’ll be reviewing the top seven juicers on the market. Juicers are appliances used to turn healthy foods like fruits and vegetables into delicious, vitamin-rich drinks. They save money and offer owners the opportunity to create their own flavors and preferences. Touted as one of the latest must-have healthy food contraptions, many different manufacturers are now producing these machines. Let’s dive in! Centrifugal juicers are the most common type and use a rapidly spinning blade and a mesh filter that separates the juice of the produce from the skin through centrifugal force. The juice and its pulp separate so you are left with only juice. Masticating juicers, on the other hand, extract juice from fruits and vegetables by crushing the fruit and vegetables and then pressing them to extract the most juice. This process is slow but very efficient. There are both advantages and disadvantages to choosing this type. They are great because they are easy to find and typically less expensive than other types. They can also produce juice very quickly as they often have a large feeding chute that lets the user put an entire fruit at one time, saving a lot of time with preparation. They are easy to use and can create juice on demand. Centrifugal juicers do not come without their downfalls. One problem with this type of juicer is that the fast-spinning blade creates heat, which then kills some of the beneficial enzymes in the produce you are juicing. The heat that is generated also oxidizes the nutrients, which creates a juice with fewer health benefits than you would get from a cold-press juicer. They also create less juice than others because the pulp that is ejected from the fruit is still wet, which creates juice waste. This also means that the extracted juice is made up of mostly water. Because leafy vegetables, herbs, and wheatgrass do not contain a lot of water, they’re not very effective when trying to juice these nutritious foods. The juice that is extracted must be consumed immediately and cannot be stored due to its rapid oxidation process. The high-speed blade also puts a lot of air in the juice, which causes it to be frothy. The motor on a centrifugal can also produce a lot of noise as the motor spins very quickly. 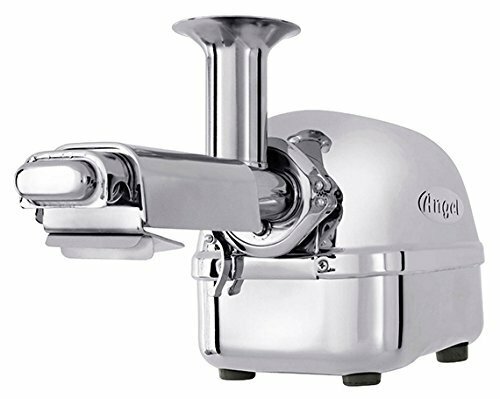 Compared to centrifugal, masticating juicers are much easier to take apart and clean after use. They typically come with a quiet yet powerful motor that is very effective for juicing hard or leafy vegetables. The juice preserves its nutrients and enzymes in the refrigerator for up to three days, so you are able to make juice in bulk or ahead of time. Masticating also yields more juice than a centrifugal juicer and does not cause the juice to be foamy. They do come at a higher price than others, however. They also take more time to create juice because the motor works slowly and the feeder tube in small. This requires the user to prep the produce by cutting it up into small pieces. This masticating juicer is newly updated and improved. It is fully automatic and comes with an upgraded motor, cooling system, gearbox, safety sensors, and control panels. The anti-jamming system on this model works by automatically adjusting its speed control when the machine is becoming overloaded. It also comes with an automatic reverse function to reduce the incidence of jamming. It produces a dark, rich juice that is highly concentrated in nutrients. The quality and taste of the juice that is produced are higher and fuller in body than other juices. It also comes with a brush and glass Pyrex jar for storage and cleaning. See more information about the Super Angel Deluxe, and buy one by clicking here. The Hurom HZ uses the latest technology to create great-tasting juice. Its slow speed measures in at 43 revolutions per minute, which is similar to the effectiveness and motion of squeezing juice by hand. Additionally, the AC motor is essentially silent and works efficiently with just 150 watts of power. This means you can make cold-pressed juice at home without creating the loud noise that is caused by other juicers and blenders. Made of stainless steel, it allows for easier cleaning, as well as the ability to make ice cream. Its long list of accessories helps this product function in many different ways. Want to see what everyone else thinks about the Hurom HZ? Click here! Breville has two models on our list, when it comes to quality and a well built machine, they’re hard to beat. The first is the 800JEXL Juice Fountain that boasts a 1000-watt motor and the ability to cut through food easily, leaving the consumer free of prep work like cutting and slicing. The design and power allows it to cut through and process food easily. The Breville 800JEXL can handle whole food just fine. Foam is separated from the juice during the process of juicing. A better tasting juice is the end product. Comes apart easily and can be put in the dishwasher for fast, simple clean up. Larger size means an adequate amount of counter space is necessary. 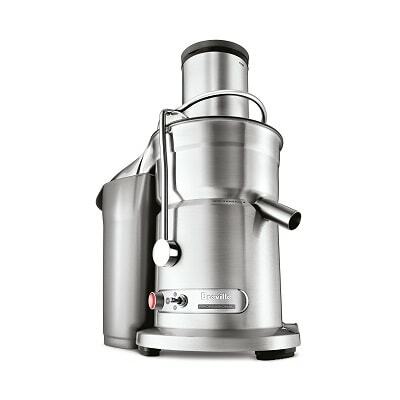 Check out more reviews, and buy the Breville Juice Fountain Elite by clicking here . KitchenAid is a known name in household appliances. This juicer machine is a quiet addition to the kitchen that offers consumers a choice of multiple speeds and ways to adjust for how much pulp they want in their drinks. The Kitchen Aid KVJ0333QG produces smooth juice without the bother of consumers having to slice and dice food before putting them in the chute. The pulp screen allows consumers the choice of having a juice with more pulp. Despite the powerful motor, it’s relatively quiet. The easy-to-understand instruction manual makes using this Kitchen Aid product simple and non-threatening. Takes time and effort to clean. While the machine comes apart so the consumer has access to everything, it’s not a fast or simple task. Check out more information about the KitchenAid Easy Clean, and buy one by clicking here . 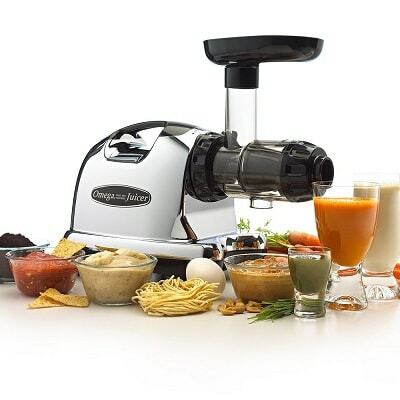 The Omega J8006 Nutrition Center Juicer has been on many must-have lists for a while now. With the ability to protect the enzymes within the food and still produce a large amount of juice, the Omega has the right features to go the distance. Consumers can make their own nut butters or use it to mince herbs. 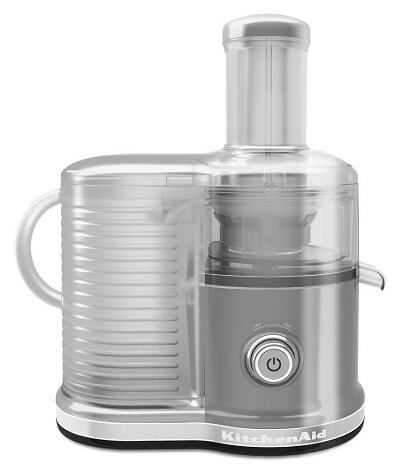 The powerful motor and masticating structure makes this juicer work well as a food processor. Processes juice slower than other options. This protects the enzymes in the fruits and vegetables and allows juice to be stored longer before being consumed. The producers of the Omega J8006 are so confident in their product that they offer a 15-year warranty. 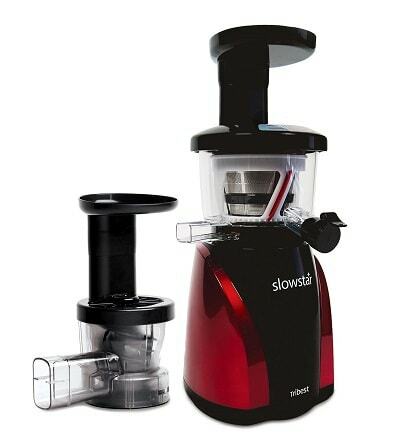 Takes slightly longer to produce juice since the masticating motor moves slower than a centrifugal juicer. Want to see what everyone else thinks about the Omega J8006? Click here! The Tribest SW-2000-B does more than just juice. This machine comes with an attachment that makes it possible to mince herbs and spices as well. The Tribest SW-2000-B has three speeds but runs at a low enough pace that the enzymes within the food are not compromised. Like the Omega J8006, the Tribest has the ability to process nut butters and sorbets, making it great as a food processor. The ten-year warranty ensures peace of mind for the consumer. Takes more time to put together, take apart, and clean than other similar models. 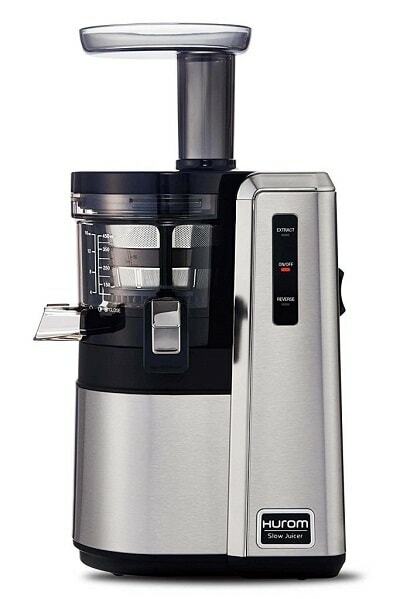 Breville makes the list twice with the JE98XL Juice Fountain Plus. This one has an 850-watt motor and a safety locking arm that lessens the chances of injuries and extra messes. 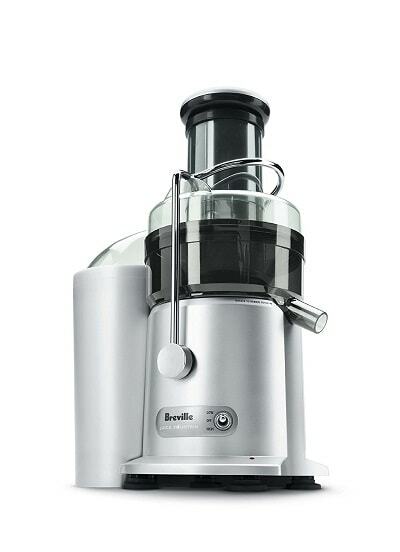 The Breville JE98XL possesses the ability to make juice faster than many options on the market. Overload protection shuts the device down when it is close to becoming overheated. This extra safety feature also offers protection for the machine’s parts. The design of the Breville makes clean up simple and quick. Due to the speed of the machine, it can cause splatters when food is placed in the chute. While cleanup is easy, there will be areas on the counters and floors in the kitchen that need to be cleaned up as well. All of these juicer machines are built to provide healthy drinks in a timely and efficient manner. However, the Omega J8006 Nutrition Center comes out ahead, making it the best among the seven we reviewed. It also comes in a bunch of different colors! The Omega’s ability to produce juice without affecting the enzymes in the food is exceptional. Though it may not produce juice as fast as a centrifugal, it still puts out plenty of high quality juice in a short amount of time. The added benefit of being able to process other foods with this same machine puts it in a category all its own.